There is something to be said about the things we cherish in life that we can count on time and time again. I can remember the days my father’s Ford F-150 was the only vehicle on the street of our snowy Chicago suburb that started up in the early morning of below 20-degree weather. Either his truck was built on a Wednesday leading up to an afternoon payday, or it was truly the most reliable vehicle within a one-mile radius of our humble two-story-and-a-basement abode. 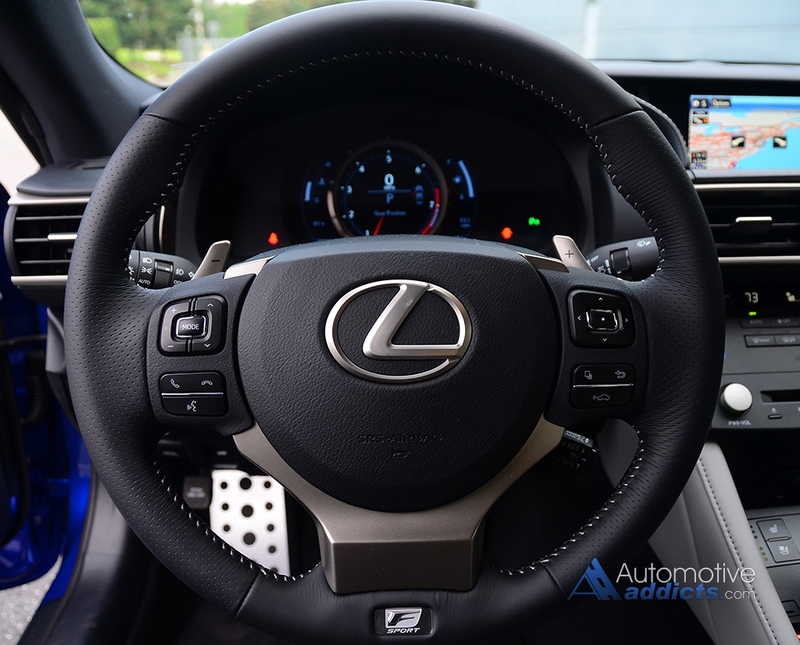 Though not a 30-year old Ford F-150, Lexus has claimed their precedence for reliability over the course of nearly 26 years relentlessly pursuing perfection under the Toyota umbrella. The continuation of that drive to pursue perfection has entered into a new chapter with the introduction of the new Lexus RC 350 and RC F. Having already embarked on a journey to test out the new Lexus RC F on the track and a variety of local roads, the RC 350 is now left to my week-long observations. As a luxury sports coupe, the 2015 Lexus RC 350 conforms to an original standout in the coveted pack of such vehicles. 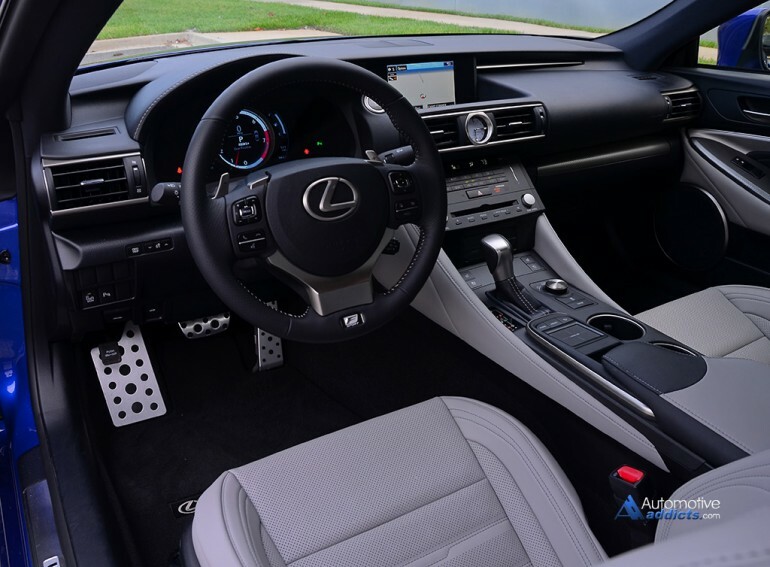 While exterior looks garnish the new-found spindle grille theme and sharp-edged lights found throughout the Lexus lineup, the RC 350 is original in its own skin as an unmistakable bold statement inside of its segment. Powered by a direct and port-injected 306 horsepower at 6,400 rpm and 277 lb-ft of torque at 4,800 rpm 3.5-liter V6 engine, the RC 350 F Sport gets up to 60 mph in about 5.8 seconds. 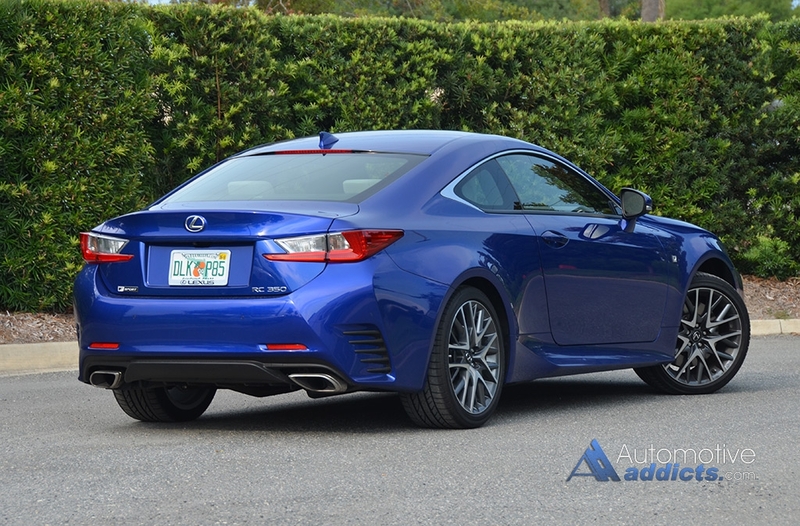 The latest V6 proves to carry on a tradition of silky-smooth power delivery to the rear wheels (or all four through an optional AWD system and 6-speed automatic transmission) through an 8-speed automatic transmission that proved to be quick with its up and downshifts under the most demanding circumstances. Certainly a much faster gear unit than the one it was derived from found in the previous generation Lexus IS F.
Employing the F Sport package for the RC 350 emulates some of the design characteristics of the high-performance 467-horsepower RC F. The front fascia receives a similar dark mesh spindle grille while 19-inch staggered wheels are added wrapped in 235/40R19 front and 265/35R19 rear summer performance tires that add agility and assurance. Additionally, the dampers are adaptive through a two-step mode adjusted on-the-fly by the vehicle drive mode set in either Sport S+ for its most aggressive ride quality to normal, which is set in all other drive modes (Eco, Normal or Sport). 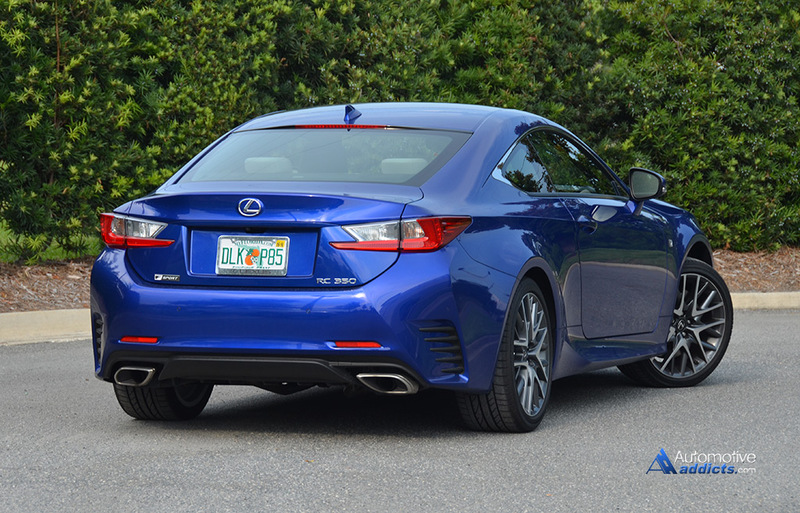 In the adaptive suspension’s normal setting the ride quality is soft and exhibits somewhat spongy rebound traits much like its Lexus GS 350 sibling. It is in Sport S+ mode where the dampers are firmed up putting the RC 350 F Sport handling and ride traits in a new category when the chassis feels better connected to the road nearing a level where it may feel somewhat at home on a track. 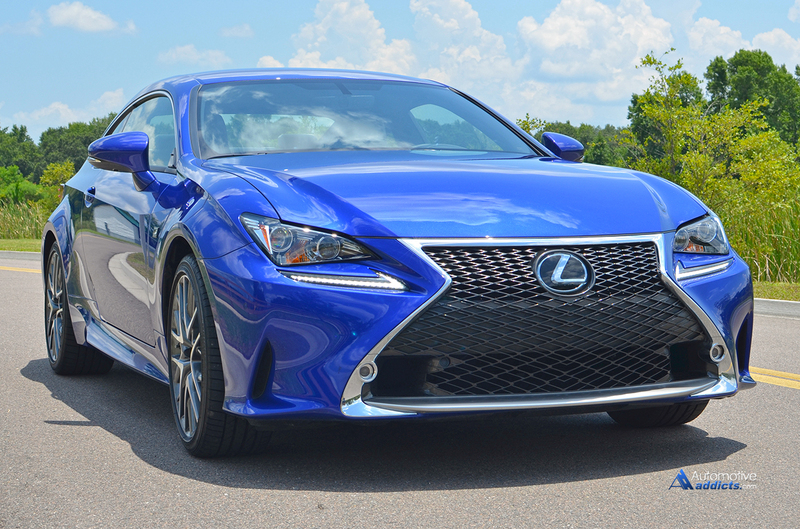 Pushing the RC 350 F Sport around is rewarding and gratifying on twisty back roads. 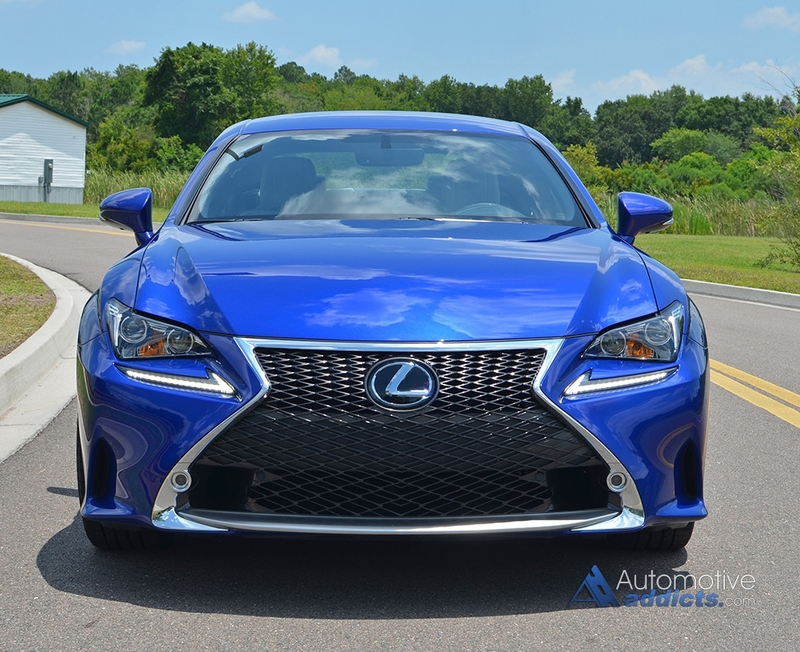 In most ways, the RC 350 F Sport feels as if it is able to handle much more power than the V6 is willing to provide. It is not to say the RC 350 F Sport is a slouch by any stretch of the imagination. In such an area, this is where the RC F proves the foundational values of its RC 350 sibling – it only gets better from there. Nevertheless, the RC 350 F Sport is more of a desirable road-going vehicle than track machine, even if the track duties are relatively light. The V6 engine is capable of making its rounds without any fuss. 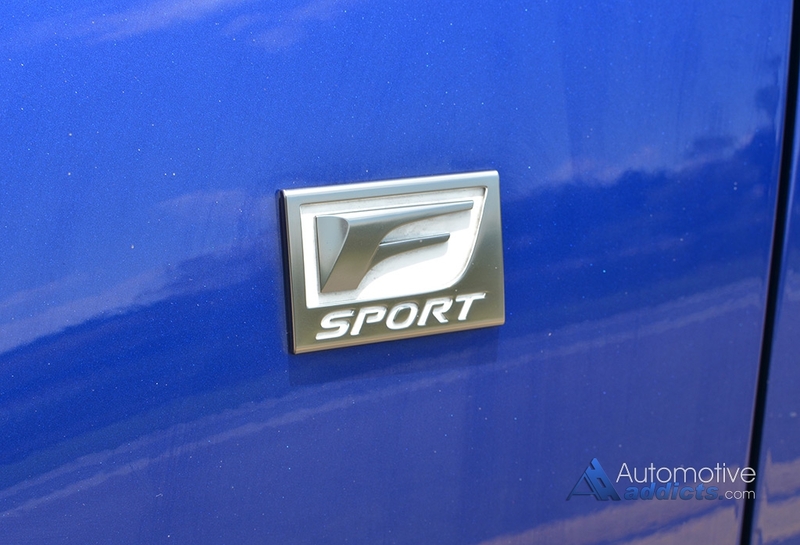 Still, it may not suffice to keep up with the likings of a BMW 435i with the M Sport package. Opening up the V6 engine and 8-speed automatic transmission’s limits by holding the traction control button down for several seconds is a rewarding case where stability control and traction control are disabled while use of the manual shift paddles mounted on the steering wheel allow you to bury the RPM needle into the engine’s 6,600 rpm redline on up-shifts. Additionally, you can perform gradual burnouts and let the rear end slide around to your heart and skill’s content. 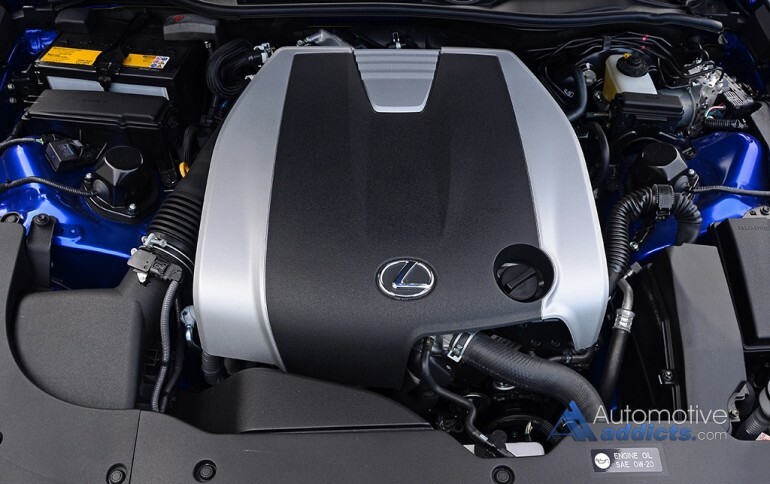 The advancements insinuated upon the RC 350 by its F Sport package are a necessary addition for light hearted enthusiast in seeking such a vehicle. 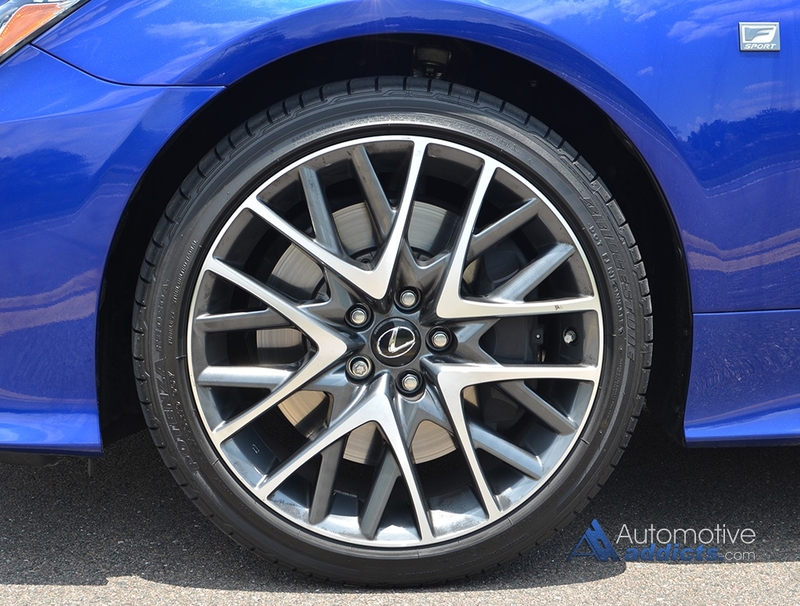 The larger wheels and tires together with the adaptive viable suspension forge an enthusiastic package with a gleaming Ultrasonic Blue Mica painted wrapper for my test vehicle. 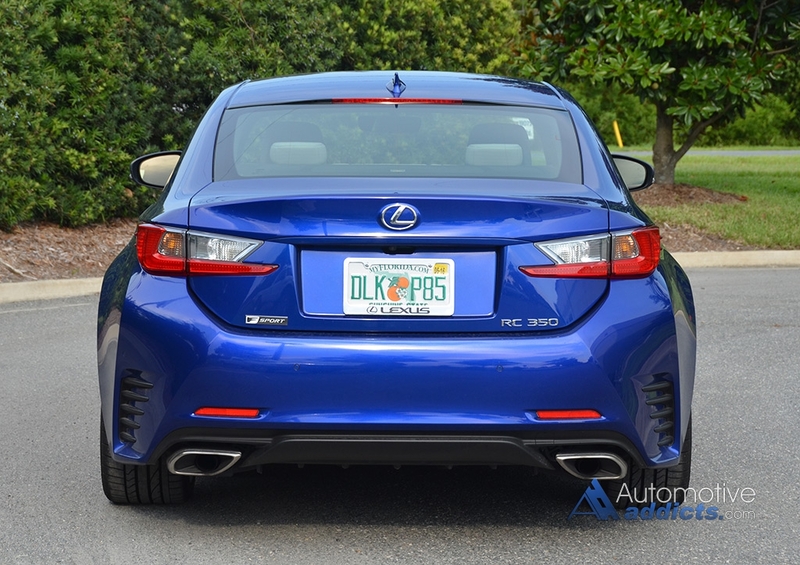 The unification of the F Sport package and the optional variable gear ratio steering (VGRS) with a rear steering system makes for an even better inclination for enthusiast. The rear steering system takes a bit to get used to but proves useful in more ways than one. It will angle the rear wheels up to 2 full degrees in the opposite direction of the steering wheel in a low speed turn, emulating a razor-sharp steering rack that requires just over 2 turns lock-to-lock when maneuvering in a parking lot – that’s just one and a quarter turn from center to lock – quite quick. At highway speeds the rear wheels steer in the same direction making it easier to change lanes or follow highway road bends. 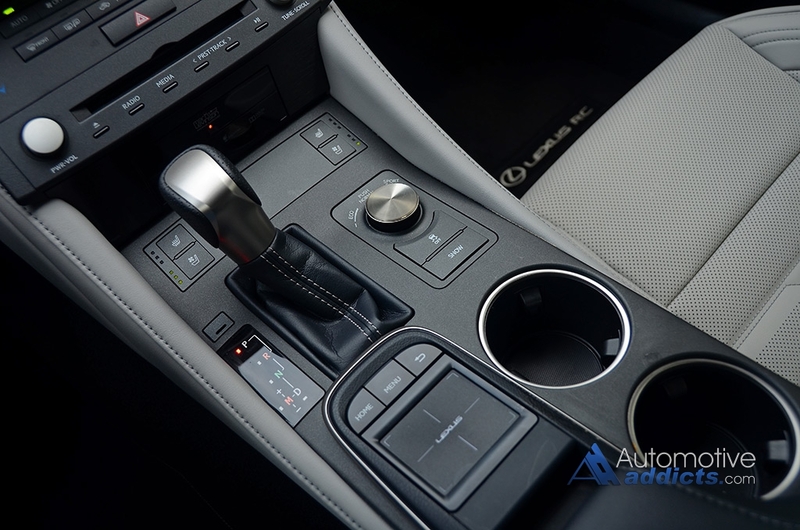 When things get moving, mostly dependent on the vehicle’s Drive Mode Select setting, the steering adds firmness and has a slight connected feel to the road when the Sport S+ mode is selected. The creature comforts of a true luxury sports coupe are in full force with the Lexus RC 350 F Sport’s gratifying list of features and options. 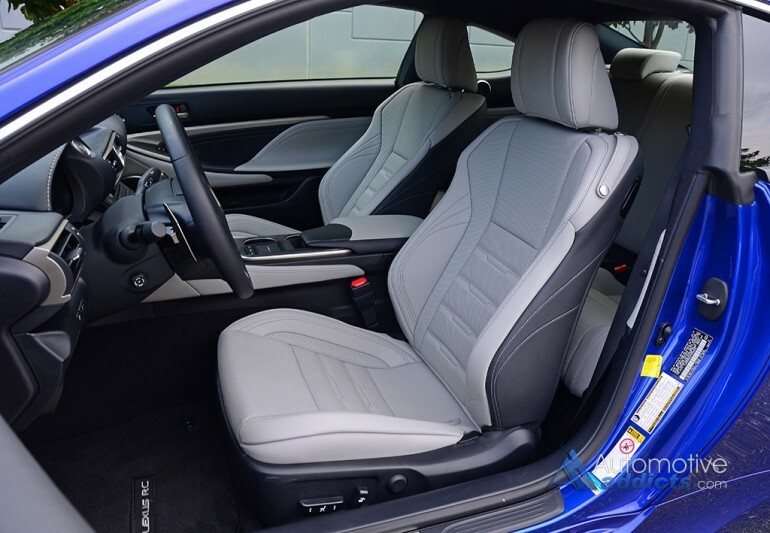 While the exterior gets its range of opulence, such as LED low and highbeam headlights, LED taillights, sporty F Sport package aesthetics and optional 19-inch wheels, the interior is laced with several soft touch and neatly accent-stitched surfaces. 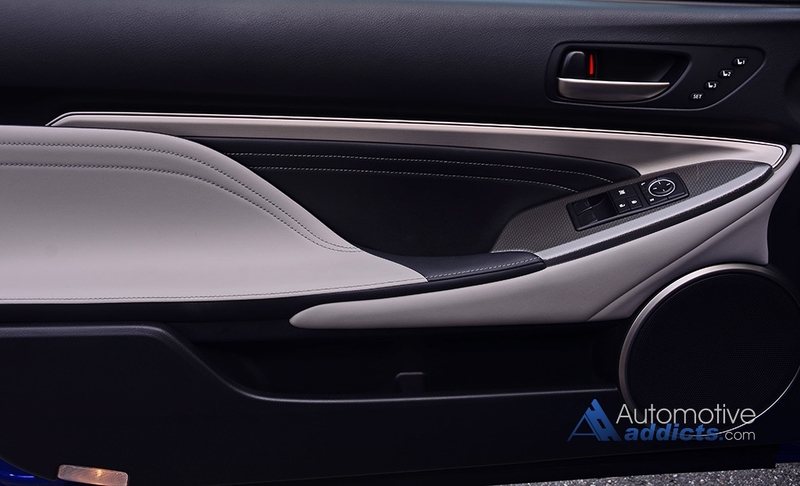 The limited amount of aluminum trim on the door panels bring most of the cabin’s tightly-nit fit and finish to a summit. 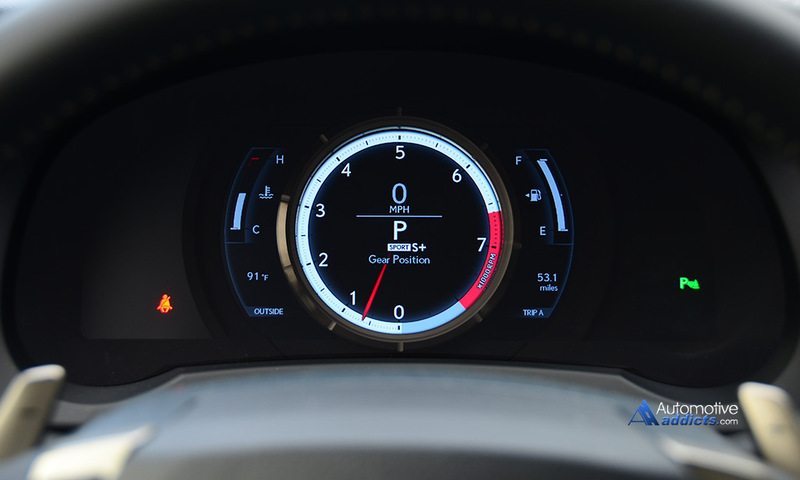 The driver’s gauge cluster features a large color LCD screen and a sporty motorized central gauge graphic unique to the F Sport package to display an array of vehicle information in a couple reserved configurations dependent on the drive mode – a page taken from the RC F and the Lexus LFA supercar relative. Use of the optional Dynamic Radar Cruise control combined with its pre-collision system helped me avoid encounters with law enforcement in more ways than one. 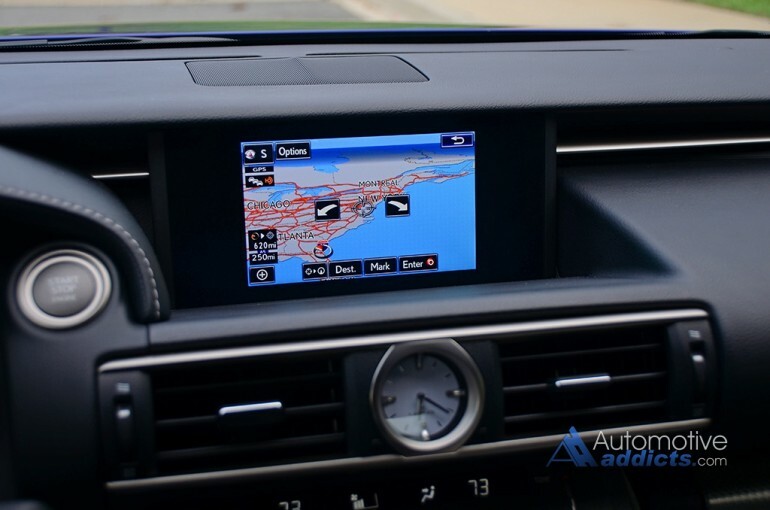 Use of the infotainment system is pretty strait forward. Though, use of the new trackpad with its haptic feedback is an acquired taste. Its use may take a slight learning curve. Fortunately, the system allows the haptic feedback to be adjusted or simply disabled by turning it all the way down, making the trackpad seem like a traditional unit on a laptop. I get where Lexus is going but I can only think how much I miss the touch screens in older Lexus IS vehicles in this case. 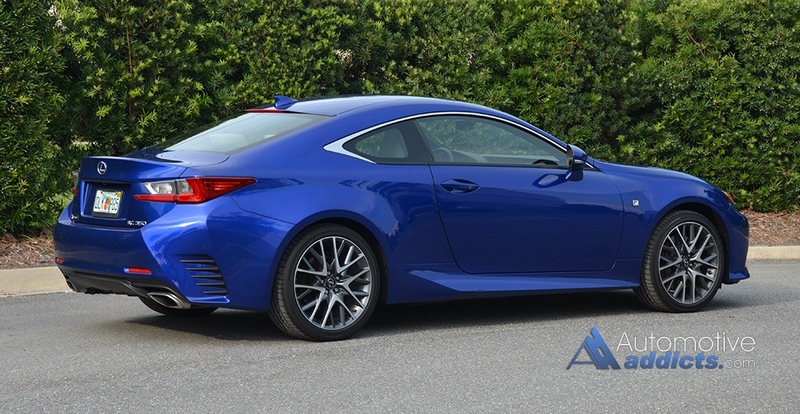 The 2015 Lexus RC 350 F Sport gets an EPA estimated 19 mpg city, 28 mpg highway and 22 mpg combined. Around town with a balanced mix of city and highway driving I saw a steady 23 mpg average. While on the highway, I was able to get nearly 29 mpg allowing the dynamic radar cruise control to keep pace at 70 mph without much drama from its gradual acceleration programming upon automatically slowing for right-lane traffic. The front seats have robust bolsters that virtually mold your body into the perforated leather surfaces, which are ventilated and heated. The 20-way power adjustments add to the high level of comfort that can be obtained for making a cross-country cruise or some spirited back-road fun. The rear seating can be understood as an afterthought for some due to the smallish size. Though, in some instances the rear perforated leather bucket seats can comfortably seat two normal to small sized adults provided the front occupants have short legs and the rear passengers are well under 6 feet tall. 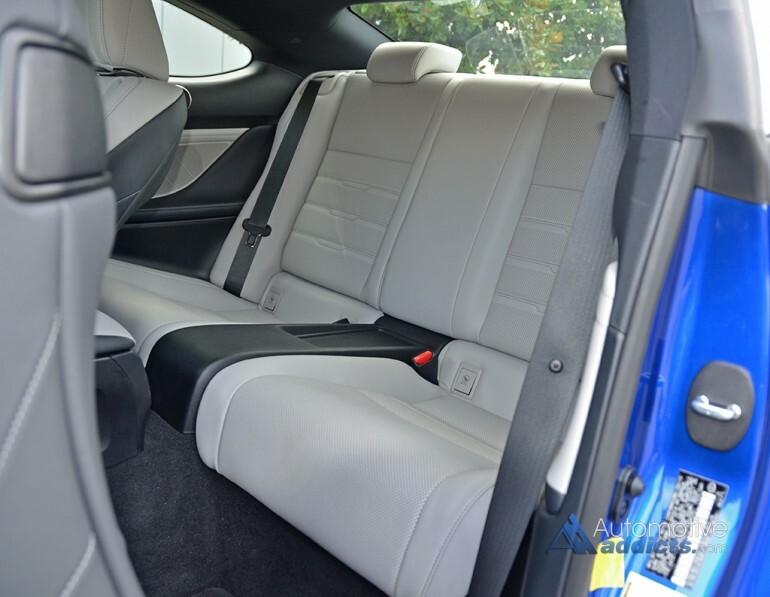 To RC’s benefit of rear seat comfort, there are two ac/heater vents routed for the rear passengers, something that goes a long way for rear passenger comfort but lacking in some of the RC 350’s direct competition. 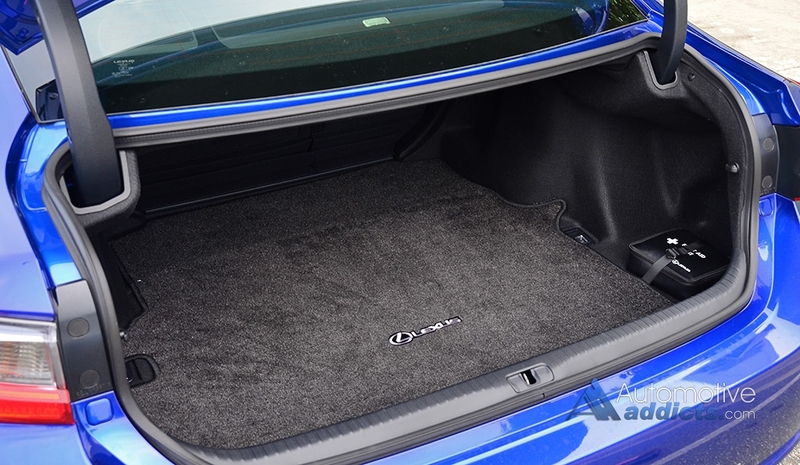 Making due with storage you can tote around quite a bit of stuff in the 10.4 cubic feet of trunk storage. That space opens up graciously by folding the 60/40 split rear seat backs down. 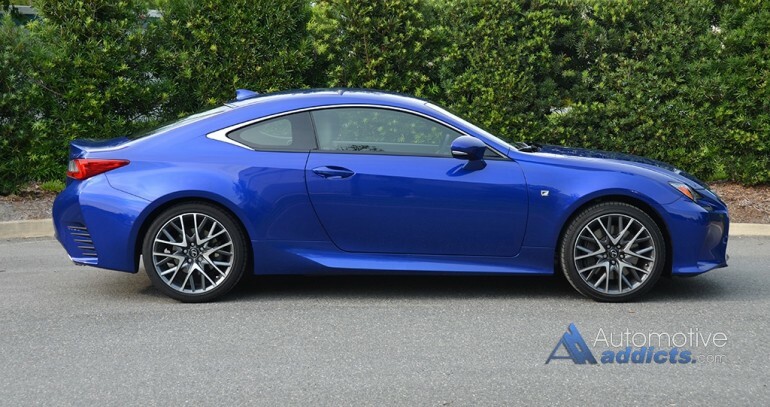 Without a doubt, the 2015 Lexus RC 350 F Sport is an appeasing luxury sports coupe that deserves a close look by those who want to express a bit of excitement but retain the long-touted reliability and impeccable fit and finish Lexus vehicles are known for. With that and the sum of a decently-optioned 2015 Lexus RC 350 F Sport, you can expect to pay $54,475 as my test vehicle came configured. 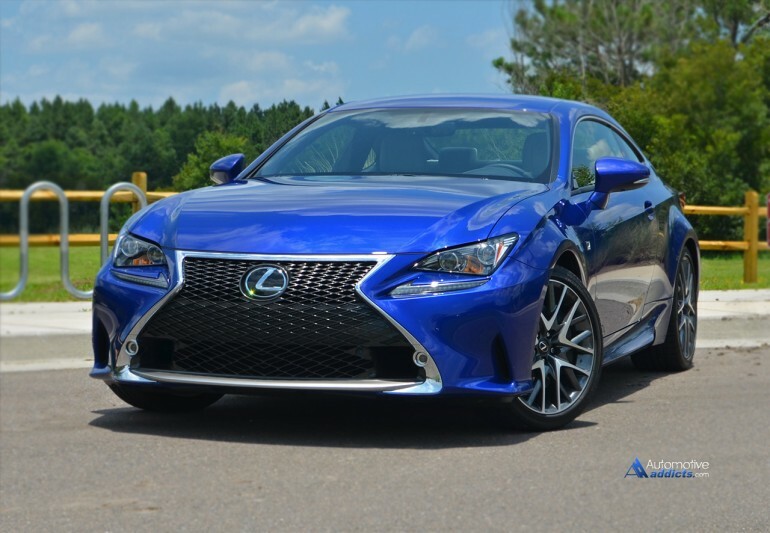 Still, at the base price of just $42,790, the RC 350 is a favorable deal that conforms to what you expect in a luxury sports coupe with a slightly edgy styling flare. EPA interior volume: 94.2 cu.ft. EPA cargo volume: 10.4 cu.ft.